whose pet means the world to them??? and we will enclose a GIFT CARD AT NO EXTRA CHARGE! to purchase this KIT for THEM! IdentaPet . . . the gift that's PURRRfectly GRRReat!!! What a PURRfectly GRReat Gift Idea! I PURRFUR to order NOW!!! St. Francis, Caregiver and Protector of Animals. When you are looking for a St. Francis Tag unlike any other . . . When all the other St. Francis Tags all look alike . . . When every place you go, every tag is what you've already seen someplace else . . . When your pet is one of a kind, and you want a one of a kind tag for them . . .
Our EXCLUSIVE Design for YOUR EXCLUSIVE Pet! Tags measure 1 1/4" in diameter. Everyday you surround your pet with your love. of their very own Patron, St. Francis of Assisi. On the PRACTICAL side a VERY IMPORTANT reason I like this tag is because your information can be changed as many times as necessary. When going on vacation, kenneling, having a temporary caregiver, moving, or a change of phone number. Simply fill in a new piece of paper (for added durability use a waterproof pen or your computer), insert in tag, and voila' -- instant updating for your pet’s security! YOUR PHONE NUMBER (if wanted on tag) WHEN ORDERING. until the information can be obtained. Beautiful, Solid Brass St. Francis Medal or Tag. or attached to your pet's carrier or crate as an ever watchful protector! Handcrafted in the USA. Measures 1-1/4" in height. the back of the tag is READY for ENGRAVING. (Perfect for People or Pets. Inscription reads, "Praised be My Lord with all His Creatures". heartfelt sentiments of caregiver’s everywhere! and frame for a lasting remembrance. Yearning for nothing more than to be by my side. Pure bred or mixed, it doesn't matter. Teaching me that nothing is more important than sharing a loving bond with another living creature. Showing me that life is lived best if lived in the moment, without worry about what tomorrow may bring. Proud and perfect I'm reminded of how simple life can be. Ever faithful, ever watchful, everything I do is important to you. Devoted and forever loyal you expect nothing in return from me other than my love. Glad to be "owned" by someone as wonderful as me. But we both know who really “owns” who. Running, jumping, sleeping, playing, I watch, I learn, I remember . . .
Each and every moment I have shared with this magnificent creature, my best friend, my soul. Every day may I acknowledge that to have you is a gift, to love you is a blessing, to share your life an honor. This Certificate, Verse & Design in its entirety and separately are Copyright 2004 IdentaPet. All Rights Reserved. This material may not be published, rewritten or redistributed. a Living Tribute or a Loving Memorial to a Precious Pet! Printed on Natural Parchment Paper perfect for framing! A place to keep and note all the important times of your pet's life. and place your pet's picture behind the opening. 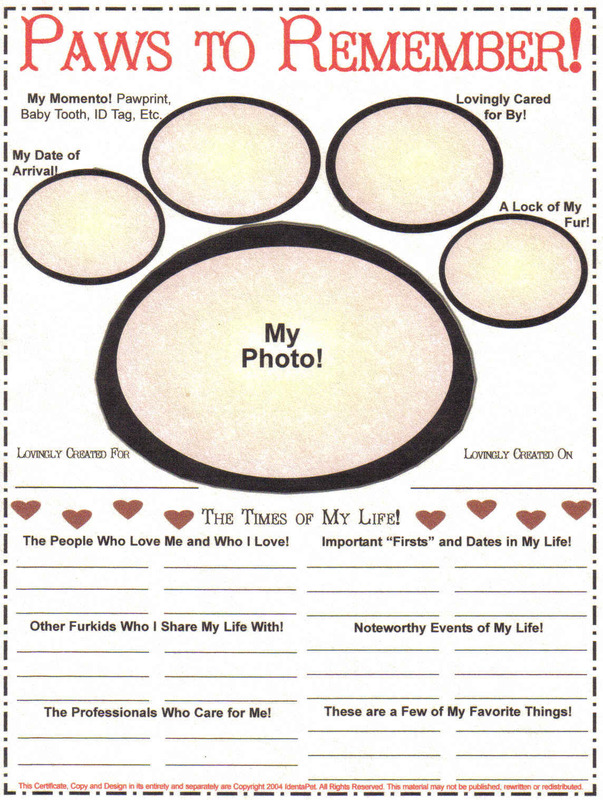 Next, fill in the information or place the designated "mementos"
and autograph and fill-in the blanks below the pawprint! There you have it -- A Cherished Keepsake for a Cherised Pet! a part of my pet's remembrance! Each remarks what a wonderful keepsake it is. And inevitably, they order one for themselves! Both are a "must have" if your pet is a pampered pet! 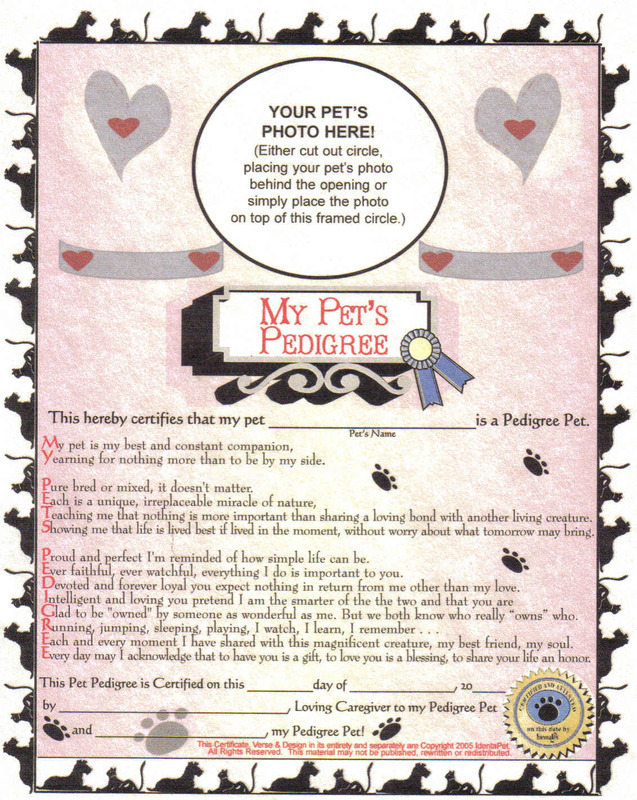 This Certificate, Copy & Design in its entirety and separately are Copyright 2004 IdentaPet. All Rights Reserved. This material may not be published, rewritten or redistributed. your furkid's grrrreat new IdentaPet PetSake Kit? Search right here!